La Colección 1 ~ "Character, energy, strength, daring… Inspired by the character and heritage of Spain, this fragrance from Loewe evokes the Mediterranean with a lively blend of Bulgarian rose, orange blossom and Mysore sandalwood." La Colección 2 ~ "The wonderful search of the perfect lover. The one capable of stopping time with a caress. The one capable of turning an instant into eternity. 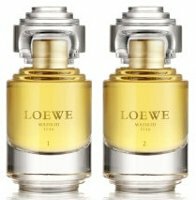 This Loewe fragrance romances with dreamy notes of redcurrant, Egyption jasmine and Mysore sandalwood." La Colección 3 ~ "Desire captivates us, dominates us, unleashes us, makes us fly, makes us excessive. Desire demands life, pleasure and dreams. This fragrance from Loewe features captivating notes of bergamot, iris and cedarwood." La Colección 4 ~ "An olfactive experience that catches our senses and moves us. Inexplicable… Something that you feel, that you live intensely with your body, your memory, your soul…this fragrance captivates with notes of ylang-ylang, jasmine and vanilla." The Loewe La Colección fragrances are £190 each for 50 ml Eau de Parfum, and can be found now at Harrods in the UK. As a brand that is off-axis France, England and the United States, Loewe is underestimated, after the excellent “7” this collection strikes me very curious. It looks like Harrods brought in the whole collection, although how long they’ll be there I don’t know. Wish these would come to the States. they have had these in Harrods for a few months now, tucked away in the gentlemen’s lounge on the lower ground floor. a couple of them were pleasant but not enough to make me splash out £190 for 50ml !! Yes, Harrods generally doesn’t put things on the website for ages, and sometimes never. Would it be a misunderstanding to think that these are basically the Les Exclusifs of Loewe? They sure sound that way to me. But in that case, it’s odd that they’re only at Harrods, unless there are plans for wider distribution later. What are we supposed to make of this “mysore sandalwood”? Are they thinking we don’t know it’s impossible to actually have that, or do they really have some connections with the Indian Sandalwood cartels? And in that case do I want to support it? I wish it was real sandalwood, but if it’s not, it just shows me the company is at least full of it in their marketing dept, if not entirely. Doesn’t make me run to shell out the $$. Mysore sandalwood…. Girl please! I don’t really see it that way myself…there’s no reason to think *any* note you see listed, ever, is “real” — it’s the PR dept’s job to make it all sound good. The “redcurrant” isn’t “real”, so why should the “Mysore sandalwood” (or anything else listed) be real? When we see ambergris, it’s probably not real (and most people today would rather it not be), ditto for musk, ditto for oud, and often ditto for the flowers too. I do know what you mean — it wouldn’t really be ethical if it was used, so hard to see why they see it as a selling point. But can’t tell you how often I see “Egyptian jasmine” or the like in a cheap fruity floral fragrance that probably has no real jasmine at all. When I’m doing note lists for fragrance announcements, I often strip all the country designations because there is no reason to think they’re accurate. Here, I was quoting so I let it stay. Quite possibly, “Mysore sandalwood” is an indicator that there’s no real sandalwood at all, from anywhere, in the mix — just some synthetic woods.